The aim is to clarify how the cooperation between sectors and disciplines in the context of “Urban Development and Health” can be fostered. Concepts, methods and findings of transdisciplinary research are given special attention. The project “Urban Development and Health – Building Bridges across Disciplines and Sectors” is funded by the Fritz and Hildegard Berg-Foundation (Deutsches Stiftungszentrum / German Center for Foundations). The overall program collaborates with it’s program advisory board, it’s research groups and it’s individual projects and uses a variety of methods for data collection, analysis and assessment. Prof. Dr. med. Rainer Fehr, MPH, Ph.D.
Univ.-Prof. Dr. Claudia Hornberg, Dipl.-Biol., Dipl.-Ökol. 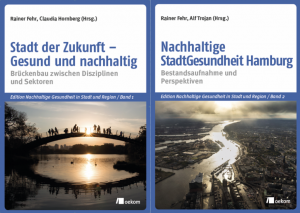 Fehr, R. (2016): Leitbegriff „Urban health – StadtGesundheit“ (letzte Aktualisierung am 14.01.2016). Eintrag in die Online-Ausgabe des Glossars Leitbegriffe der Gesundheitsförderung und Prävention der Bundeszentrale für gesundheitliche Aufklärung (BZgA). Druckfassung: pp. 258-264 in: Bundeszentrale für gesundheitliche Aufklärung (Hg.) (2016): Leitbegriffe der Gesundheitsförderung und Prävention. Ergänzungsband 2016. Glossar zu Konzepten, Strategien und Methoden. Redaktionsgruppe: Trojan, A. (Leitung), Kaba-Schönstein, L., Franzkowiak, P., Blümel, S., Nöcker, G. Verlag für Gesundheitsförderung, Grafling. Fehr, R., Mackenbach, J. (2016): Health impact quantification for a culture of ‘‘foresight’’? Dyadic Workshop, part 2 (9.K), 9th European Public Health (EPH) conference, Vienna, 10-12 Nov 2016. European Journal of Public Health 26 (01): 289-290. Hornberg, C., Fehr, R. (2016): Modeling of health and disease in support of governance and decision-making – Conclusions. Presentation in Workshop 9.K, 9th European Public Health (EPH) conference, Vienna, 10-12 Nov 2016. European Journal of Public Health 26 (01): 290. Mackenbach, J., Fehr, R. (2016): Health impact quantification for a culture of ‘‘foresight’’? Dyadic Workshop, part 1 (8.K), 9th European Public Health (EPH) conference, Vienna, 10-12 Nov 2016. European Journal of Public Health 26 (01): 256-7.